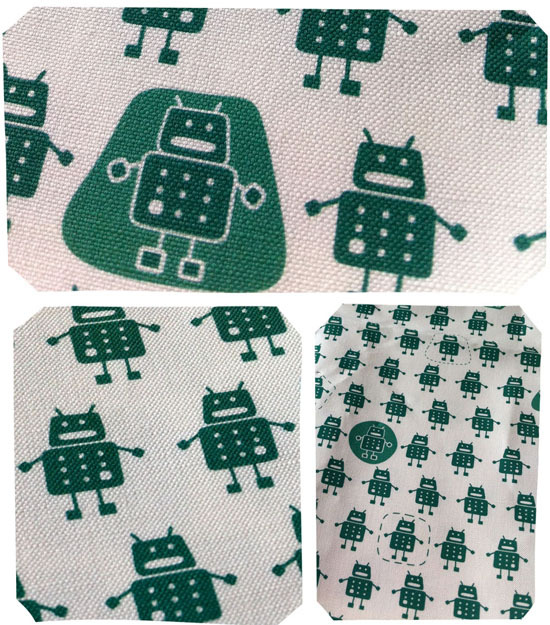 Remember my post about my robots being available to buy on Spoonflower? Well, my sample finally arrived the other day! I am so pleased with how they look. I chose to print my fat quarter on their linen/cotton canvas. They say that this particular fabric would be good for tea towels, amongst other things. Well, they certainly are right. It has a gorgeous weight to it and is lovely and firm with a dense weave. I just have a teeny tiny dilemma now....will I use my piece to make something to sell...or something for us...or for a gift? Whichever way I go - how the heck am I going to decide what to use it for!? Pencil case - cushion - back pack - pillowcase - ??? What would you suggest I make and do with whatever I make? Any and all suggestions would be gratefully received!